Ismanuel Diaz opened a café in the first floor of his family's house on Central Avenue. BUSHWICK — The gourmet coffee, repurposed wooden walls and whimsical drawings that have popped up in this Central Avenue space seem fitting with the neigborhood's trend of burgeoning cafés — but Express Yourself Barista Bar is more than the typical coffee shop. Three Bushwick brothers just opened the café on the first floor of their childhood home — and they see the space as a community hub and even a place for activism. "We wanted a good environment to embrace the new people...and coffee goes across all cultures. It's almost like a common denominator," said one of the brothers, Ismanuel Diaz, who still lives in the building. "We've seen the whole process of the neighborhood's changes, with a lot more diversity coming into the neigborhood." Diaz, 29, and his brothers — whose mother bought the 82 Central Ave. building 27 years ago but didn't use the first floor because it was zoned for commercial use — opened Express Yourself two weeks ago, Diaz said. Already, the brothers are hosting a community meeting about Bushwick's controversial rezoning next week, and they regularly invite local artists and musicians to exhibit and perform in the café, Diaz said. "You need to know what's going on in your neighborhood...If we can have an influence we want to," said Diaz, who also chats with everyone who enters the shop to tell them of his aspirations of the café as a hub. "This is our space, but really it belongs to the community." Diaz, whose grandmother came to Bushwick about 50 years ago from the Dominican Republic, previously worked as a Starbucks barista, for seven years in Midtown, which he said helped develop his discerning coffee taste. 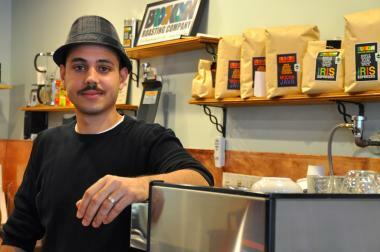 He serves Brooklyn Roasting Company coffee and an array of espresso-based drinks. "The associate at the counter gave me a sample of one of the lattes...I was hooked," a customer who goes by Ray. F wrote on Yelp. "I bought a small cup and I was like WOW. This tastes delicious." Diaz's work at Starbucks not only informed his taste in coffee, but it also gave him insight into one of his passions. "I learned at Starbucks I liked to be able to talk to different people every day," he said. "I talk to every person who walks in here." Diaz said he and his brothers might take an "activist" role in the Bushwick rezoning process if they feel it's necessary. "Right now we're in the learning phase," he said. "We just want to do the right thing. That's one thing our mom taught us." For local activist Brigette Blood, an organizer of North West Bushwick Community Group, the Diaz brothers are already in the center of dialogues about the neighborhood's rapid changes. "I am so happy to meet my neighbors the Diaz brothers through the North West Bushwick community meetings," Blood said. "Their ideas and energy were a most welcome and great, solid addition to our last community meeting." Blood said Express Yourself could serve a much-needed role as a physical space for the community "to gather, learn, grow and share information." "This has the potential to be a wonderful and unifying space for our diverse Bushwick community," she said.